The coach is said to be unhappy about the lack of investment in new players. 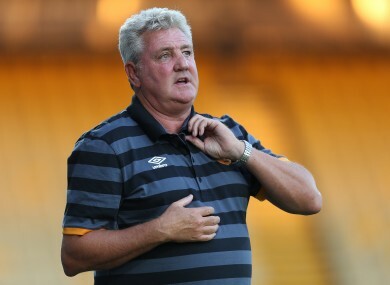 Hull manager Steve Bruce pictured during the recent pre-season friendly match at the One Call Stadium, Mansfield. STEVE BRUCE RESIGNED as manager of Premier League newboys Hull City on Friday, according to several media outlets, just days after he held talks over taking the England job. The 55-year-old, who lost out to compatriot Sam Allardyce for the England post, had taken Hull up for the second time into the Premier League but is said to be unhappy about the lack of investment in new players. According to The Daily Mirror that was his reason for tendering his resignation although the BBC blamed uncertainty over the future direction of the club as it is presently up for sale could also have played a role. Bruce, who signed a new three year contract in March 2015, didn’t take training on Friday morning, according to the Daily Mirror. Although Hull steadfastly declined to respond to the reports, midfielder Tom Huddlestone appeared to confirm the news in a tweet. “Never good to lose a manager especially one who has signed you and done so well for the club. Wish him all the best for the future,” Huddlestone wrote on his Twitter account. Ironically Bruce, who guided Hull to the 2014 FA Cup final where they lost in extra-time to Arsenal, could well replace Allardyce at Sunderland, who he managed from 2009-11. His departure is not the best-timed coming just weeks ahead of the beginning of the Premier League season. Bruce was interviewed for the England job by the Football Association on Monday. Email “Steve Bruce resigns as Hull boss days after England snub - reports”. Feedback on “Steve Bruce resigns as Hull boss days after England snub - reports”.